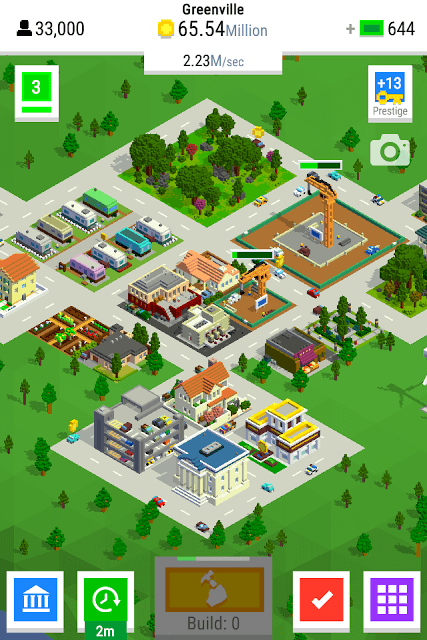 Nimblebit Games has launched another addicting pixel-art game called Bit City. It’s an idle tapper that lets you build and grow a city, much like Build Away. You can construct residential and commercial buildings, purchase cars and airplanes and earn money, which can be used to construct new properties on empty slots. The bustling lively pixel city looks gorgeous once you have completed construction. Your objective is to grow your city and reach a population goal to move to bigger and more challenging terrain. New stages will force you to manage your finances, invest in select upgrades carefully and choose your property type wisely. With the help of these beginner-level walkthrough, tips and hints you will be able to know different ways to earn coins, know how Prestige works and grow your city faster. 1. There are two objectives to complete: The first and main objective is to construct buildings on empty slots, grow your city and reach a population goal. Tap the number at the upper-left corner of the screen to know how many “bitizens” you still need to reach your goal. A player finishes building a city/reaches population goal after constructing buildings on all empty slots. 2. Your second objective is to earn money so that you can construct new buildings on those empty lots. You can earn money from existing buildings. All you have to do is keep tapping the “Build” button to upgrade lower level buildings to higher level buildings. Doing this will increase the coins earned per second. You can also earn bonus coins from land and air vehicles. Buy cars from the parking lot and purchase aircraft from the airport. Vehicles can earn coins passively and also offer bonus coins. You will have to tap a coin icon that appears above a vehicle to collect bonus coins. You will have to invest in certain vehicle-related upgrades to unlock their passive earning ability. 3. When you tap an empty slot, you will be given three choices: Residential (Homes, Villas etc. ), Business and Service. Before selecting a building type, check which type has low demand or high demand. Construct those buildings that have normal or low demand to keep a healthy balance between all three building types. If you keep constructing one type of a building, then you will see a “Lower demand” underneath it. The number below each type shows how many buildings of that type are constructed on a land and is shown in percent. So if a residential type has 28 percent, Business has 42 percent and Normal has 28 percent of city, it means that there are more business type buildings than residential and service buildings. 4. There are various ways to earn more coins. You can invest in various upgrades, such as property tax, ticket quotas and DMV fees. You can access upgrades by tapping the Blue City Hall button on the bottom of the screen. You will need to spend coins to acquire an upgrade. 5. You can also earn extra coins for a limited period of time via Boosts. Tap the green boost button located just beside the Build button to access “Double Time”. It doubles the coins per second you are earning from your buildings and cars. Watch a short video to activate this boost. You can also pay bux to fast forward construction and earnings. 6. The “Bitizens Bank” also earns coins passively. Tap the Yellow building to access your bank. Next, tap the “Upgrade” button to increase branch profits. Doing this will let you earn coins from your bank also. When you reach a new city, you also keep earning money from your previous cities’ bank branches. So make sure you invest in bank upgrades before moving to a new city. 7. Complete tasks to earn bux. Tasks can be accessed by tapping the red button at the lower right corner of the screen. Sometimes the task button will appear on the upper left corner of the screen. 8. You can take a photograph of your city. The best part of this feature is that it lets you choose a proper angle before taking a snap of your city. 9. Tapping the “Prestige” button will let you start from the beginning, back to city 1. But there are certain benefits: All game upgrades that you have chosen so far won’t disappear, plus you will get to keep bux and keys you have earned. When you tap the Prestige and Collect Button you will earn the same number of keys as mention below the trophy icon. Each key provides a +1 percent earnings bonus. So if you have moved to City 4 and decide to “Prestige”, you will be collecting around 15 keys, which would mean a 15 percent bonus. Prestige is just a form of “Ascension”, a popular feature you have seen in most idle tapper games. As you move to big territories, you will come across different sizes of empty lots. Constructing buildings on bigger lots would require more money, so focus on erecting buildings on smaller lots first and keep investing on upgrades to earn more coins. You can then start constructing buildings on big empty lots one by one. As soon as you start constructing buildings and earn money, the first thing you should do is upgrade and max out property tax. The money you earn from your constructions will be increased by 500 percent as soon as you finish this upgrade. When you max out an upgrade, the button vanishes and the green bar becomes full. The next critical upgrade is the DMV Fees. Further upgrading it will allow your purchased vehicles to earn passive income. You can earn up to 300 coins per second. Don’t forget to max out Ticket Quotas. This will increase the car coin bonus by 100 percent. You will have to tap a coin icon over each vehicle to get bonus coins and with this upgrade you will earn double the bonus coins from your vehicles. Reach new tiers by maxing out a few upgrades at the City Hall. For example, to reach tier 2, you will need to max out at least 2 out of 4 tier 1. An upgrade is maxed out when the green bar underneath it is full and the button disappears. New tiers offer more earning opportunities. For example: In tier 2, upgrades “Housing tax will increase passive earnings of only residential buildings. Upgrading the “Services Grant” in tier 2 will increase services earning. You can also buy “Game” upgrades at the City Hall. But you will need to spend bux to buy them. There are some cool upgrades such as “Road to Riches”, that reduces car bonus spawn times, Aerospace and Auto Sale that reduces costs of airplanes and cars by a certain percentage. Save bux for such upgrades. You can earn bux by completing tasks (tap the red button to know your current task). Cars may also drop a few bux randomly so keep looking for a dollar icon above vehicles. When you are not playing, your bank saves the money for you. To save more, upgrade your bank (yellow building). 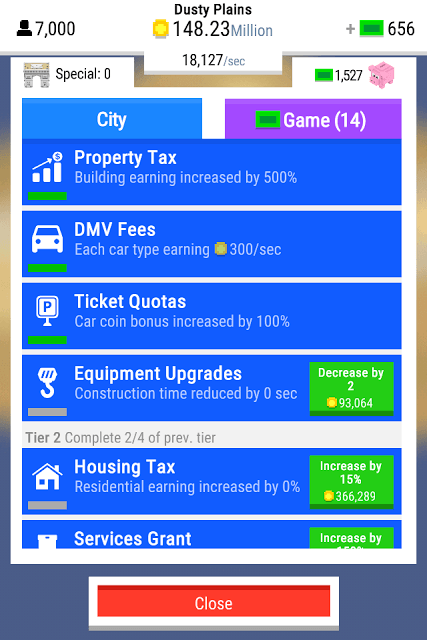 When you open the app, the game displays the total amount your city gained and offers to double the amount. Just tap the “Collect 2X” button and watch a video to get your rewards. When you reach a population goal, don’t move to a new territory immediately. Keep earning money from your buildings and upgrade bank as much as you can. When you move to new territory, banks of previous cities keep earning money for you. You can see their earnings by tapping the yellow button.